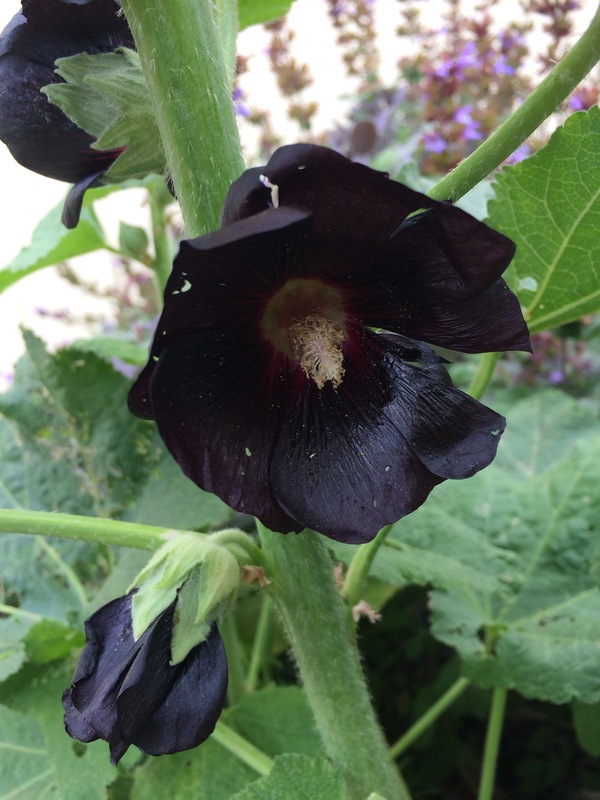 I love it when black hollyhocks appear, having self-seeded. It’s like having Edgar Allen Poe or Neil Gaiman popping in for a cup of tea. 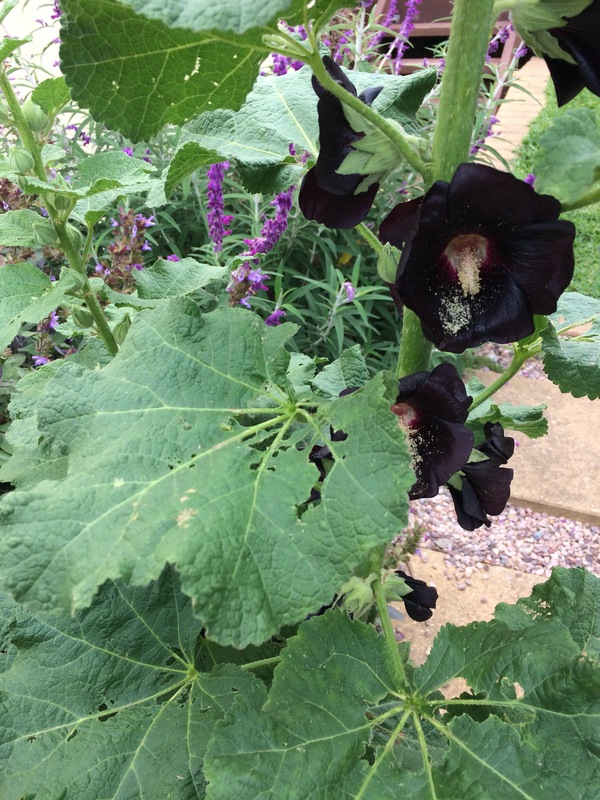 Sometimes, they cross with other hollyhocks, and appear more of a dark purple. The darkness can be variable each year, so when you get a true deep black emerging, it feels a bit magical. This years are a lovely velvety gothic night-sky dark. The pollen falls like stardust on the petals. 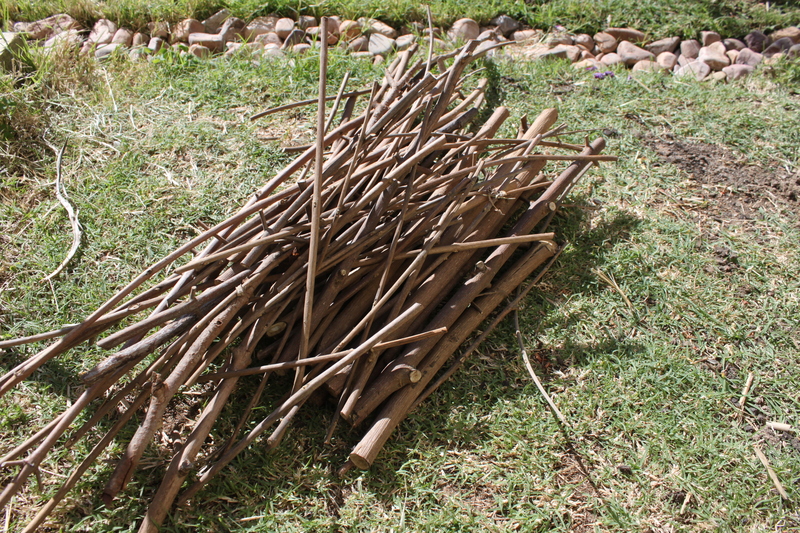 Now that I’m half way through my Permaculture Design Certificate (PDC) theory, I’m about to take a really good crack at some intentional design in terms of applying permaculture principles in an average sized garden. 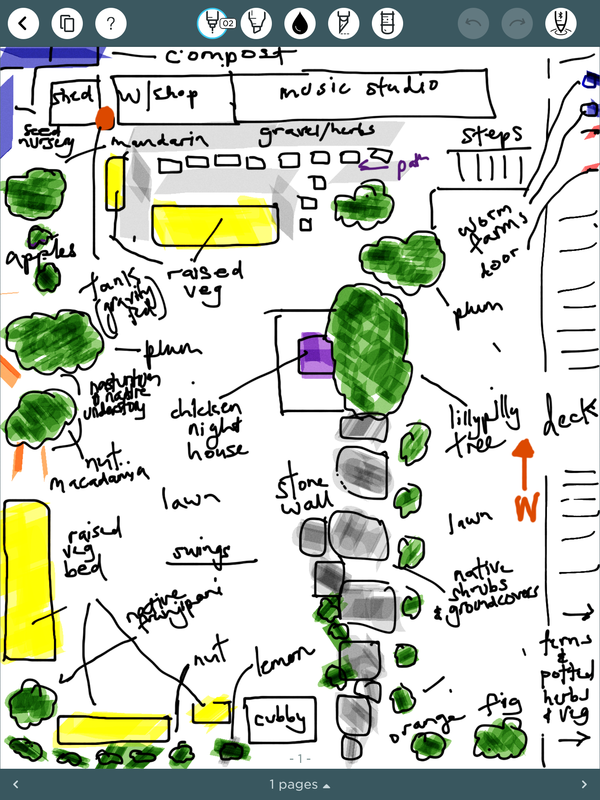 Below, is the layout of the productive backyard that we now have after five-six years of ad-hoc design with permaculture principles in mind, but without really any formal or deep understanding. 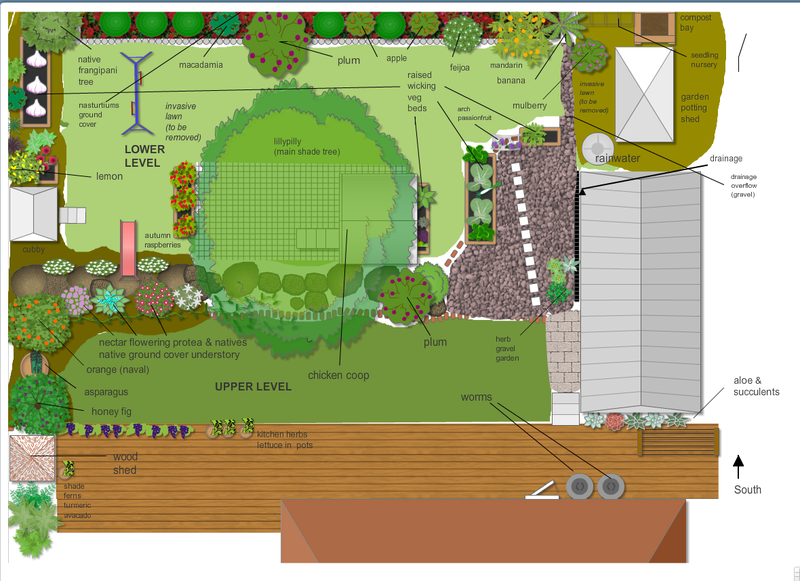 Bringing it all together as a whole, is where hopefully having some idea of permaculture design principles will help so that I can see the space and the little areas of potential. 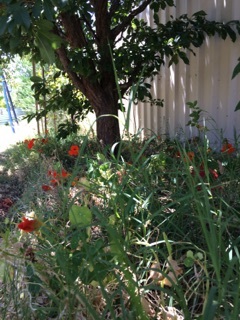 I wanted to capture where we are now, and how this young productive garden emerged, before I start my final design project for my PDC and for anyone else working on their PDC with a small space. Six years ago we moved away from our 20 acre rural block, our dream hobby farm – into a house on about 890 square metres. 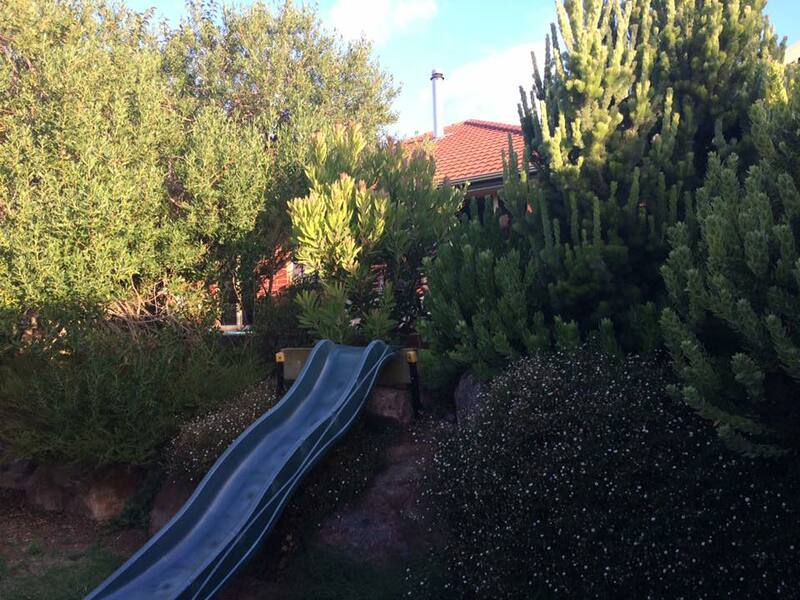 We were in our 30s so not really traditional ‘downsizers’, but the property was situated precariously on a ridge top, had limited access and in summer we had a close call with bushfire without any access to water. Leaving our farm was the hardest thing I ever did. We left space, epic views, secret valleys, winter rivers, echidnas and wedge tailed eagles, space for orchards you could walk through and just everything I had dreamed of. We went to a normal street, into a normal house into a normal space that meant no more cows, goats or roosters or wild places. I still have days when my heart pines to be back there, listening to the wind blowing through sheoaks. But, as it tuned out, we were able to slowly create a more sustainable future. A slow retrofit is still in progress, starting with insulation and adding internal doors for example. 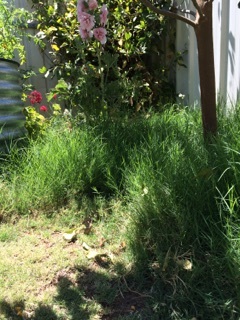 We now have less reliance on cars, can walk into the Main Street of our small town rather than having to drive everywhere, could afford to upgrade solar hot water and power, have massively reduced electricity consumption and no electricity bills – even our house sewage septic system is recycled for viticulture irrigation. 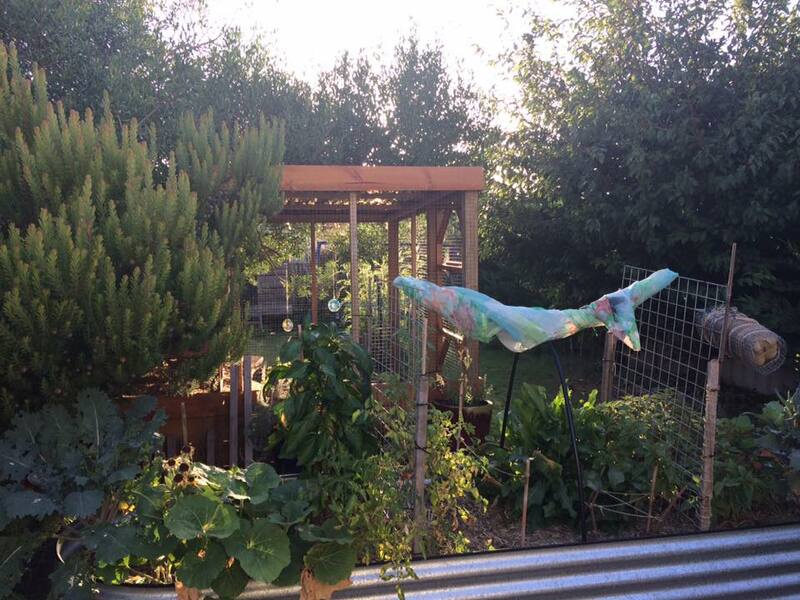 Instead of feeding cows and maintaining fences I food gardened. 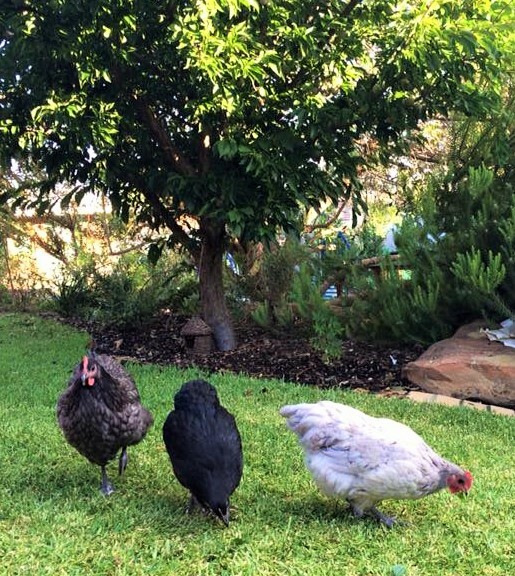 We moved into bareness in the backyard – just rectangles of invasive lawn, 3 spindly young fruit trees and no soil. I was eight months pregnant and managed to throw a few veg seedlings in to settle in. 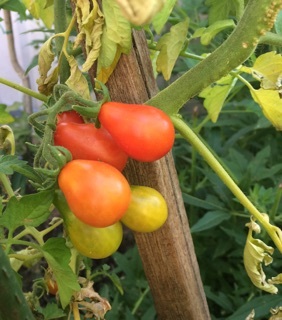 We both work professional jobs and have young children and yes, I have to be honest, ALL my free time over the last six years is mostly immersed in food gardening. 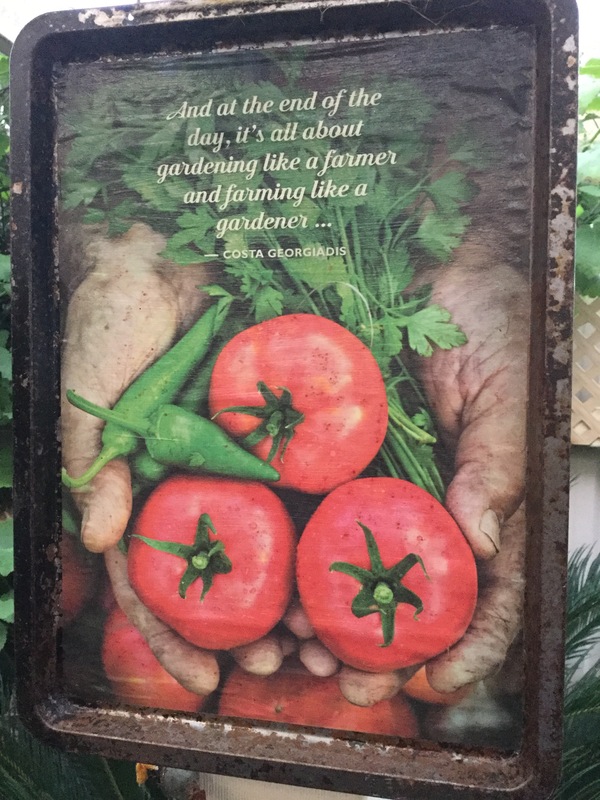 Or reading about others about food gardening, or talking to others about food garden or thinking about food gardening. My daughter described me as “mad about permaculture” on a poster describing their mums at school. Maybe I am mad putting all this heart in. On days I was too exhausted with my baby son, I would be up early to watch episodes of Costa’s Garden Oddyssey I found on DVDs and it became a morning ritual with a baby and four year old. I had a moment of understanding that this was going to take time and to start with the soil – to build soil – and be patient. 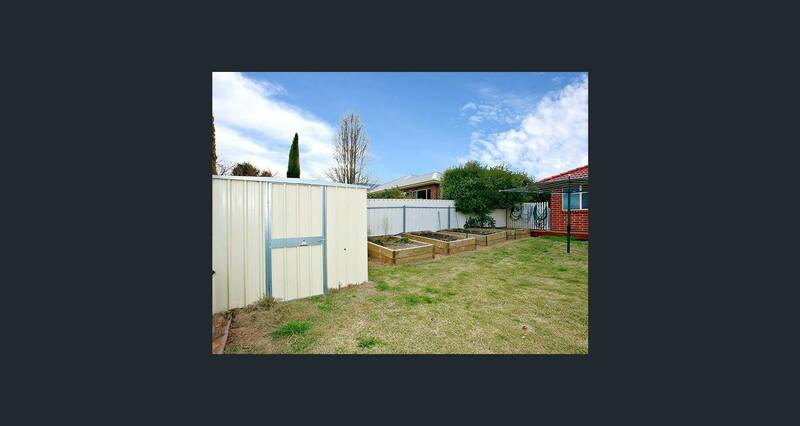 In 2012, I started lasagne gardening/sheet mulching this place to build soil . 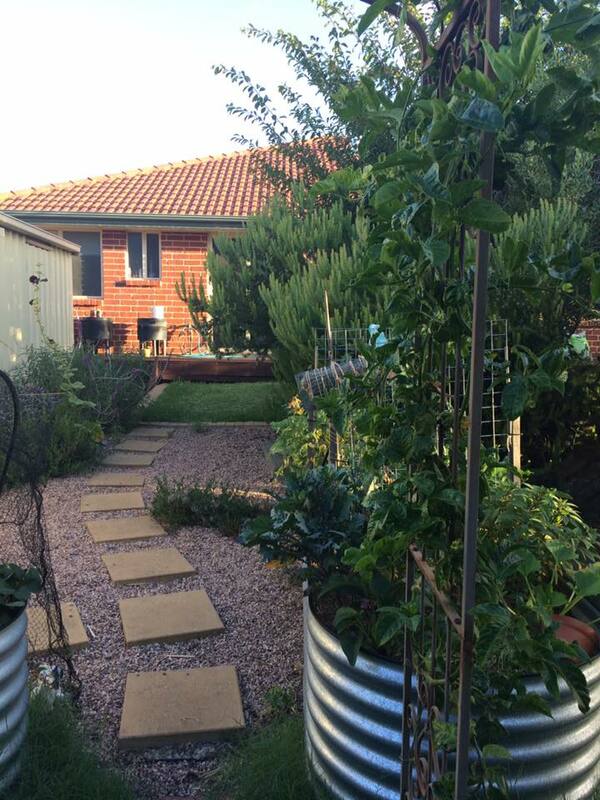 I borrowed books on permaculture from the library and dreamed of the backyard forest that this garden could be. It was imaginary. There was no design, no vision, just a hazy idea of what could be daydreamed, the design emerged in the edges of everything else. It felt right to design informally in this way with dreams by the fireside, experiments and failures. Bit by built we built structures, and after 4 years finally culminated in adding chickens . 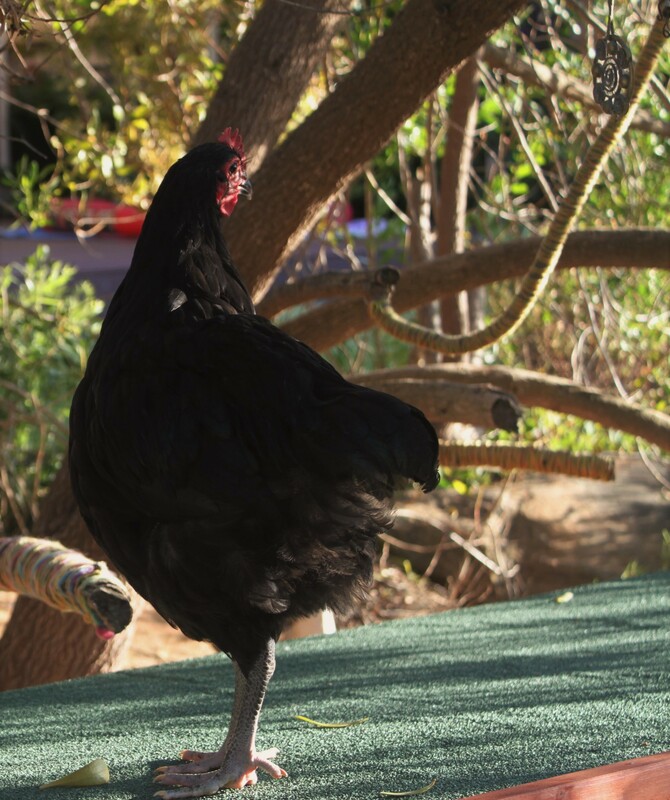 When they arrived I felt the backyard farm had become! So, undertaking this PDC has given me an unexpected concern. I’m feeling doubtful about whether I’m suited to designing gardens properly on paper -with any precision. 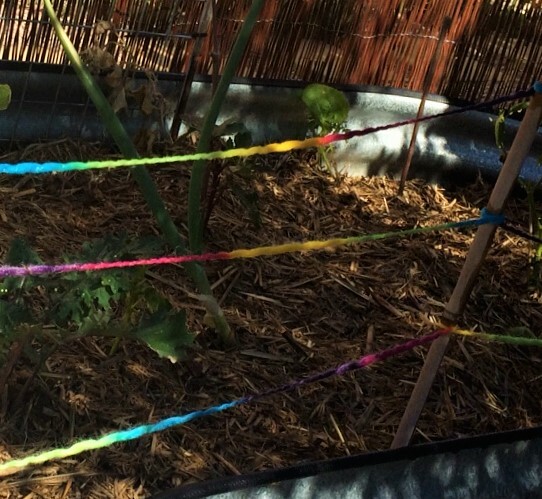 It feels…unlike me to garden on paper. I’m trying though. I measured out my space last week to roughly get the plan I put together to scale. Sort of. But I wonder if others feel this way. To be truthful, drawing it out first feels like it kills the wonder a bit for me. But…what I want to encourage is simple. Start where you are. Right now. In whatever way it feels right to begin. Don’t wait until you have “the dream acreage” don’t feel that you have to have big space to apply permaculture design. Learn now from the tiniest space. In 1999, my first veg garden in my 20s was a front garden patch of about 15m2 in England. We won a prize because it was seen as a novelty to grow veg amongst cottage garden flowers – but it was all the space we had. 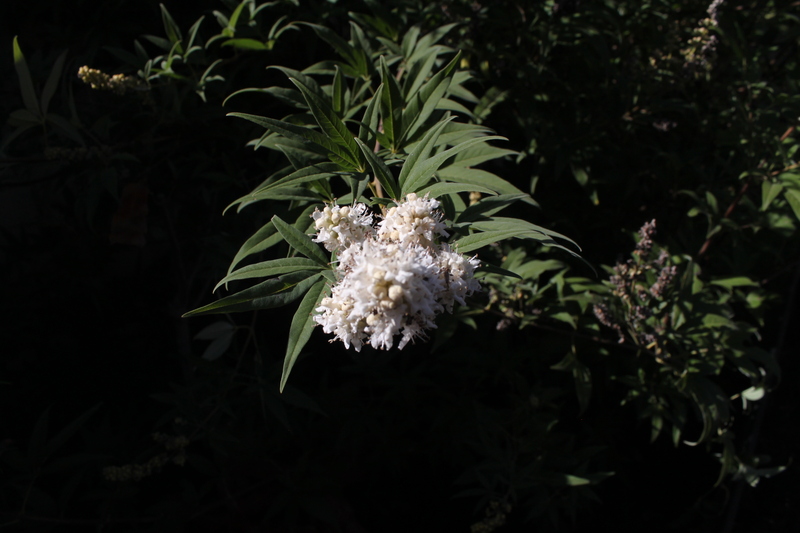 The design – intercropping – emerged from the limits. Limitation can be the spark. Any space can be enough room to grow. Any space can be everything you need, if you can begin with valuing the potential of what you do have. If you still need more trees, visit them. Or if you need wilderness (which yes, I really do miss in my deepest soul) go forth and camp there, or join in an effort to plant trees there. If you dream of more growing space, volunteeer in your local school or community garden. And then come home to grow where you live. And live where you grow. And take your growing, where ever you go.